V.R. Janis writes young adult fantasy infused with Native American elements. She explains her tips for using social media and other marketing avenues. 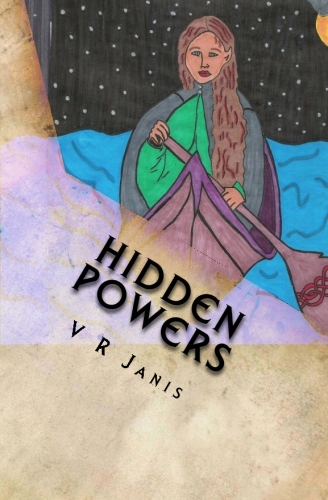 If you are looking for an adventure, Hidden Powers is for you, with magic, elves, dragons and struggle. This book combines the Anishinaabe culture and language with fantasy. A young elf maiden flees the world she has always known and enters a confusing human world. She faces foes that are determined to destroy the world she loves. This book is for young adults, but anyone can read and get lost in the world that this writer has created. I explored all of my options and decided this was the best for me. I retain the rights to my book and determine what happens with it. I control every aspect of my book from the cover to the price. No, I have not been traditionally published because I did not pursue that option. There are good parts and there are bad parts, but overall I have enjoyed the experience. I dislike having to do all the marketing myself, but as far as I know that is the only downfall. I have created bookmarks. I am on Facebook, Twitter, and LinkedIn. I have an author page on Facebook (VR Janis). I also have a blog that I try to keep up with. I do multi-author book signings in my local area. I also am going to be speaking about my experience in writing and being a self-published author. I have not seen any that I did not try as of yet. However, there are always new ideas springing up. Marketing is a pain in the bum. Writing is the easiest part and then it gradually gets harder. Cover, layout, pricing, publishing, marketing. Having a mentor is invaluable; my mentor has guided me along the way. Nothing, I have grown with each step I took and I do not regret any of it. It is hard and sometimes a little intimidating, but this is the path I was supposed to walk. Use the social networks to your advantage. Find sites and promote your book, it is all about getting your name out there. I am working on a new series and finishing up the third book of the Hidden Magic Trilogy. I am waiting on two books from my editors, the first book in my new series, Stolen Light, and the second book of the Hidden Magic Trilogy, Hidden Memories, and then I will publish those. I am a fantasy writer with a twist of traditional Native American culture. They can find me on Facebook or like my page VR Janis. They can view my blog at janisvr.blogspot.com. They can follow me on Twitter (@VRJanis). They can contact me at vrjanis@yahoo.com. And they can find my books on Amazon.